Late summer. Tomatoes ripening in the garden as we pick the last peas of the season; a few tired maples beginning to turn toward autumn; cicadas, katydids, crickets singing deep into our dreams. We begin to look forward, into the change, into school and ripe apples and pumpkin pie. Soon, my daughter turns one. I remember these final days of waiting last year, how I was ripe like the season, ignorant of all the pain and brokenness I would walk through this year. Because in many ways for me—and though I know this is not something I “should” say, not something acceptable in a culture that often views birth as a wonderful, transcendent experience—Ramona’s birthday was the worst day of my life, and though this year has been filled with much joy, it has also taken this whole year, will take much longer still, to fully heal from the terror of that day. Ann Voskamp and Sue Monk Kidd and Henri Nouwen and Frederick Buechner have guided, are guiding this journey into love—love for Ramona (how mysterious and wonderful the love of a mother for a child), love for my own broken self, love for the God who guides me into and through this painful journey. This year, I am full of thankfulness. I am filled with eucharisteo. I am broken, but I am blessed. On Saturday, I finished a study I’ve been doing with my mom on Sue Monk Kidd’s When the Heart Waits. One of the study questions asked us to draw what we think playing with God would look like. I wrote in my journal, “Playing with God is wonder and discovery,” and spent an hour sketching pictures of Wisconsin wildflowers: Virginia bluebell, columbine, Solomon’s seal. I am letting go of the notion that I control my future, that I can plan my next move. I am letting go of dreams that I now see were foolish and ill-conceived. As I let go, I am learning to wait open to the future. I know life is suffereing as well as grace, and I would be naive to believe further suffering does not await me. Yet still I must wait open, unafraid. God knows the path he has chosen for me, both cruel and sweet. And in the end I will find my new self fully birthed, being nursed in the loving arms of Jesus. Every single day, there are a thousand, thousand graces bestowed upon me. The path of peace–the path that relinquishes bitterness–sees and names and glories in these graces. And then yesterday, I woke to a crying baby. My little girl, usually so playful and happy, had big tears on her perfect, chubby cheeks. She refused to be comforted and would not nurse. As the day wore on, she continued to fuss; as I got out my breast pump, the stress wore on me. In the afternoon, when Ramona was crying uncontrollably in my arms and would not come to my breast, which is so often her solace, I held her on my shoulder and cried, too. To give ourselves a break from the stress of the day, we went out for a walk. I breathed deep and tried my best to stop fretting, to take in the freshness of the cool afternoon. My mind was winding a deep path of worry and I was leaning on myself, trying to climb out by handholds made of wet clay. 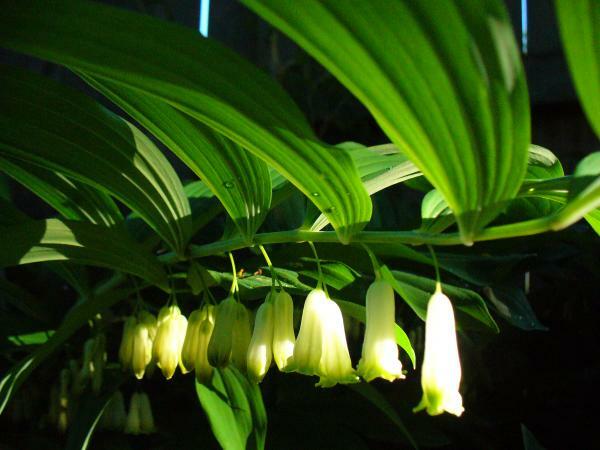 Then, on the lakeshore path, I looked to my right and saw Solomon’s seal in thick weave along the path. Thank you, Jesus, for never giving up on me. I think I’ve known for a while that symbols are important, that they break open your deep places and spill light into soul-caverns. One that has been with me for some time now is the tree with its age rings. How it grows outward to newness only through embracing and accepting all of itself–everything it’s experienced, all the pain, the moments where everything seemed lost, the moments of weakness. All this must be enveloped in order for growth to happen. It is a love of oneself, of each bruise and burn that defines the shape and texture and breath of life. This is the lesson I have seen in the tree, that I have tried to turn away from in my diapause, my clinging to the old, familiar version of myself. But now it is also the symbol of what I can be. When I wrap my arms around a tree, I am embracing its life; I am embracing my symbol; I am embracing myself. May I learn to love me in my weakness, in my bruises, as Jesus does. Because he sees the beauty of the thing that he made. In answer to Zach’s question, "What did you think of Edith Schaeffer’s book on homemaking?" It’s hard to not feel a need to do something large with your life—something epic. What if my life goes by and I haven’t made any difference to anyone? That is the fear that drives me to paralysis. Of course I wouldn’t admit that to most people. It’s a naive wish—to make a difference in the world. Because who can? But at the same time, perhaps I need to reexamine what it means to make a difference in the world. Because I don’t have to touch multitudes to make a difference in someone’s life. Almost everyone has been a huge influence on someone else’s life. Almost everyone has only influenced a handful of people. That’s what we do: we influence on a small scale. The small scale at which we, being small, operate. We may think ‘If only…’ – If only I weren’t so tied down with the mundane things of life. If only I had had a chance to go to art school. If only I had time to develop instead of being caught in this job. If only I hadn’t this endless round of housework and crying babies to overwhelm me. ‘If only…’ feelings can distort our personalities, and give us an obsession which can only lead to more and more dissatisfaction. If only I were a better writer. If only I had more discipline. If only I could focus my life totally around that one pursuit. But that’s not what life is. We are pulled like taffy; we are straining like the edge of the water lapping on rock and sand. We are full and we are empty. We choose dissatisfaction. And then the water opens up to my emptiness and cools me with the quench of possibility. The words on this page, these little possibilities, are the chord that drags me into the sea, drags me from questioning to action. “People so often look with longing into a daydream future, while ignoring the importance of the present. We are all in danger of thinking, ‘Some day I shall be fulfilled. Some day I shall have the courage to start another life which will develop my talent.’” There can be no “another life” for me. There is just this happy open yearning pulsing one where I am a wife and a worker, a professional and an environmentalist, a lover, a Christian, a writer. I am open to a new fullness and striving towards a full emptiness. I choose to be satisfied in my desire to matter, to make a difference. Through writing—now, here, in this very moment.